Bosch all-in-one set for use with the Bosch PMF 180E & GOP 10.8V-Li Multifunction Tools. 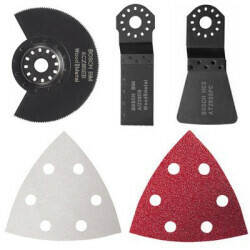 All basic applications (sawing/cutting, sanding, scraping). Also suitable for use with the first generation Fein Multimaster tool.